– This course is designed to challenge students to comprehend and analyze literary texts. Students read several works of world literature as well as poetry and shorter works of fiction and nonfiction. Writing assignments develop students’ critical thinking skills and creative expression. The course also provides a study of grammar, mechanics, usage, and vocabulary (students will take an end-of-year test in this class). NRCA’s summer reading program is mandatory for this course. 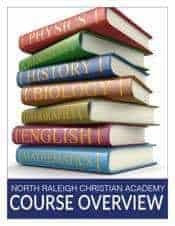 Honors English I (9th Grade) – The course is designed for highly academically advanced, highly motivated students who are capable of reading complex literature and analyzing it in terms of themes, character motivation, and cultural and philosophical contexts. Students read works of world literature as well as poetry and many shorter works of fiction and nonfiction. Through frequent writing assignments, students develop the skills of close textual analysis, critical thinking skills, and creative expression. The course provides a study of grammar, mechanics, usage, and vocabulary and is reading/writing intensive (students will also take an end-of-course test in this class). NRCA’s summer reading program is mandatory for this course. Prerequisite: Students must earn an A in 8th grade English. – This college-preparatory course focuses on the development of complex thought processes and creative expression through discussion and writing assignments. This course is designed to challenge students to comprehend and analyze literary texts. Students will read several major works of world literature as well as poetry and shorter works of fiction and nonfiction. Writing assignments develop students’ critical thinking skills and creative expression.The course provides a study of grammar and vocabulary.Time for practicing for the reading and writing and language portions of the major college entrance exams is also allocated. NRCA’s summer reading program is mandatory for this course. – This course is designed for highly academically advanced, highly motivated students who are capable of reading complex literature independently and analyzing it in terms of themes, character motivation, and cultural and philosophical contexts. Students will read several major works of world literature as well as poetry and many shorter works of fiction and nonfiction. Frequent writing assignments will develop students’ critical thinking skills and creative expression. The course provides a study of grammar, mechanics, usage, and vocabulary and is reading/writing intensive. Time for practicing the new essay portion of the SAT test is also allocated. NRCA’s summer reading program is mandatory for this course. Prerequisite: Students must earn an A in English I or an A/B in Honors English I. – This college-preparatory course focuses on the development of complex thought processes and creative expression through discussion and writing assignments. In these writing assignments, students will write for a variety of audiences and purposes, applying skills to literary analysis and research with special attention given to the connection of themes, ideas, and movements in American literature across time. The course also provides a study of grammar, mechanics, usage, and vocabulary, thus preparing students for senior English classes and the SAT writing requirement. 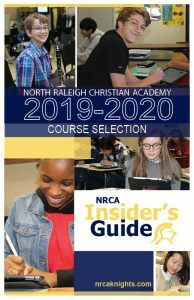 NRCA’s summer reading program is mandatory for this course. – This course is designed to challenge academically advanced, highly motivated students who are capable of comprehending and analyzing literary texts. Students will read several works of American literature as well as poetry and many shorter works of fiction and nonfiction. Frequent writing assignments will develop students’ critical thinking skills and creative expression. The course will provide a study of grammar, mechanics, usage, and vocabulary, thus preparing students for senior English classes and the SAT writing requirement. NRCA’s summer reading program is mandatory for this course. Prerequisite: Students must earn an A in English II or A/B in Honors English II. – This course is designed for highly academically advanced, highly motivated students who are capable of reading complex literary selections independently and analyzing them in terms of themes, character motivation, and cultural and philosophical contexts. Students will read major works of American and world literature as well as poetry and short works. In addition to the rigorous reading load in fiction, drama, and poetry, students will read several nonfiction essays from a rhetorical reader. Writing assignments include close textual analysis of fiction and drama and timed writings that analyze persuasive writing and create rhetorically sound arguments. Students will also study advanced composition skills, including lessons in grammar, mechanics, usage, and vocabulary. This course is extremely reading and writing intensive and may demand up to one hour of homework per night. NRCA’s summer reading program is mandatory for this course. Prerequisite: Students must earn an A in Honors English II. 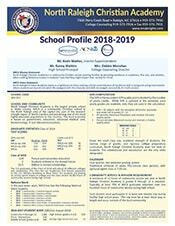 – This college-preparatory course focuses on the development of complex thought processes and creative expression through discussion and writing assignments. In these writing assignments, students will write for a variety of audiences and purposes, applying skills to literary analysis and research with special attention given to the connection of themes, ideas, and movements in British literature across time. The course also provides a review of grammar, mechanics, usage, and a study of vocabulary, thus preparing students for the SAT writing requirement and post-secondary endeavors. NRCA’s summer reading program is mandatory for this course. Honors British Literature (12th Grade) – This course is designed to challenge academically advanced, highly motivated students who are capable of comprehending and analyzing literary texts. Students will read several works of British literature as well as poetry and many shorter works of fiction and nonfiction. Frequent writing assignments will develop students’ critical thinking skills and creative expression. The course will provide a study of grammar, mechanics, usage, and vocabulary, thus preparing students for the SAT writing requirement and post-secondary endeavors. NRCA’s summer reading program is mandatory for this course. Prerequisite: Students must earn an A in American Literature or A/B in Honors American Literature or AP Language. AP Literature & Composition (12th Grade) – This course is designed for highly academically advanced, highly motivated students who are capable of reading complex literary selections independently and analyzing them in terms of themes, character motivation, and cultural and philosophical contexts. Students will read major works of British and world literature as well as poetry and short works. There is a rigorous reading load in fiction, drama, and poetry. Writing assignments include close textual analysis of fiction and poetry. Timed writings analyze prose and poetic passages and treat literary concepts from the student’s repertoire. Students will also study advanced composition skills, including lessons in grammar, mechanics, usage, and vocabulary. This course is extremely reading and writing intensive and may demand up to one hour of homework per night. NRCA’s summer reading program is mandatory for this course. Prerequisite: Students must earn an A in Honors American Litature or A/B in AP Language & Composition.